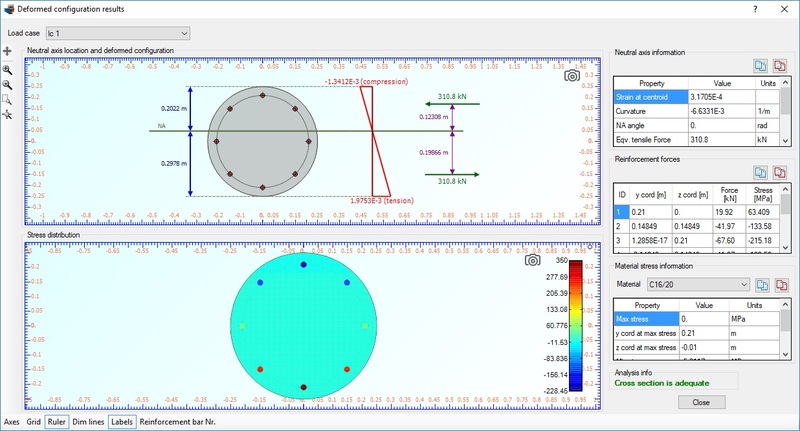 Cross Section Analysis & Design, a unique engineering application for cross sectional analysis, moment curvature/interaction diagrams, biaxial analysis, stress contours and reinforcement check/design features! For reinforced concrete checks and reinforcement design, the following codes are fully supported: AASHTO, UBC, AS 3600, IS 456, ACI 318, BS 8110, CSA A233, EC2, NZS 3101, CP 65. Now, the version 2011 of the code ACI 318 is supported for reinforcement check/design! Furthermore, the 6th version of AASHTO LRFD 2012 is also supported! What's more, some minor bugs have now been fixed. The Moment vs. Curvature Analysis has been improved. Analysis time has been dramatically reduced. The sophisticated algorithm for the neutral axis location, curvature and origin strain has been enhanced in order to converge always, regardless of the possible complexity in the geometry or materials (non-linear with negative braches). Reinforcement design is now extremely easy. The required reinforcement amount can be calculated with only some mouse clicks according to the specified code. For your convenience, all files of worked examples are included in the demo under (File->Open sample project).